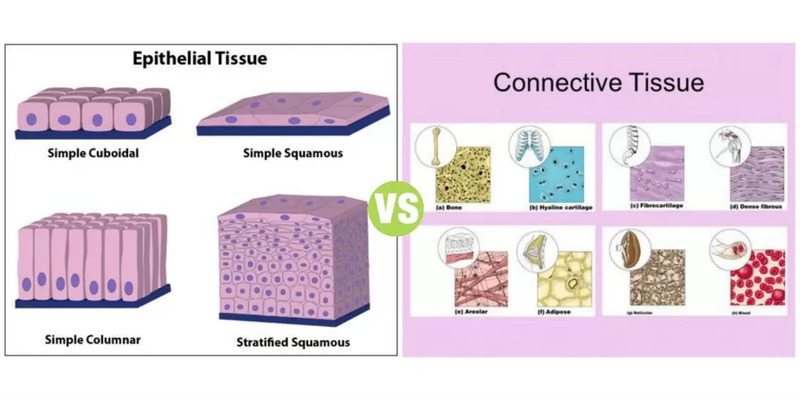 Summary: Difference Between Epithelial Tissue and Connective Tissue is that Epithelial tissue exists in many structural forms. In general, it either covers or lines something and typically consists of renewable sheets of cells that have surface specializations adapted for their specific roles. While Connective tissues support and bind. Unlike epithelial tissues, connective tissues are distributed throughout an extracellular matrix. Epithelial tissue exists in many structural forms. In general, it either covers or lines something and typically consists of renewable sheets of cells that have surface specializations adapted for their specific roles. Usually, a basement membrane separates epithelial tissues from underlying, adjacent tissues. Epithelial tissues absorb (e.g., the lining of the small intestine), transport (e.g., kidney tubules), excrete (e.g., sweat glands), protect (e.g., the skin), and contain nerve cells for sensory reception (e.g., the taste buds in the tongue). The size, shape, and arrangement of epithelial cells are directly related to these specific functions. Epithelial tissues are classified on the basis of shape and the number of layers present. Epithelium can be simple, consisting of only one layer of cells, or stratified, consisting of two or more stacked layers. Individual epithelial cells can be flat (squamous epithelium;), cube shaped (cuboidal epithelium;), or columnlike (columnar epithelium;). The cells of pseudostratified ciliated columnar epithelium possess cilia and appear stratified or layered, but they are not; hence, the prefix pseudo. They look layered because their nuclei are at two or more levels within cells of the tissues. Connective tissues support and bind. Unlike epithelial tissues, connective tissues are distributed throughout an extracellular matrix. This matrix frequently contains fibers that are embedded in a ground substance with a consistency anywhere from liquid to solid. To a large extent, the nature of this extracellular material determines the functional properties of the various connective tissues. Connective tissues are of two general types, depending on whether the fibers are loosely or densely packed. In loose connective tissue strong, flexible fibers of the protein collagen are interwoven with fine, elastic, and reticular fibers, giving loose connective tissue its elastic consistency and making it an excellent binding tissue (e.g., binding the skin to underlying muscle tissue). In fibrous connective tissue, the collagen fibers are densely packed and may lie parallel to one another, creating very strong cords, such as tendons (which connect muscles to bones or to other muscles) and ligaments (which connect bones to bones). Adipose tissue is a type of loose connective tissue that consists of large cells that store lipid. Most often, the cells accumulate in large numbers to form what is commonly called fat. Bone cells (osteocytes) also lie within lacunae, but the matrix around them is heavily impregnated with calcium phosphate, making this kind of tissue hard and ideally suited for its functions of support and protection. Blood is a connective tissue in which a fluid called plasma suspends specialized red and white blood cells plus platelets. Blood transports various substances throughout the bodies of animals.